Applications for funding are now open! Please direct any questions or requests for alternative formats to communityfund@autismandrace.com. The Autistic People of Color Fund will provide direct financial support to autistic people of color through individual microgrants of amounts between $100 to $500. Any person who is autistic and a person of color (racialized as non-white / Black, Asian, ethnic minority) is eligible to apply for funds. You are allowed to apply if you have another disability. You are allowed to apply whether you have a professional diagnosis or not. If you were diagnosed with Kanner’s autism, pervasive developmental disorder not otherwise specified, Asperger disorder, childhood disintegrative syndrome, nonverbal learning disorder, or Rhett’s syndrome, you count within the autistic community. You are a person of color if you are not white. Some examples: If you are Aboriginal, African or African diaspora, Black, Brown, East Asian, First Nations, Indigenous, Latinx (non-European), Mestizx, Mixed-race or Multiracial, Mizrahi, Native, South Asian, or Southeast Asian, you count. (This is not an exhaustive list.) If you consider yourself white, Caucasian, or white-identified, you wouldn’t count. People of all ages can apply. People who live in any country can apply. People who apply will not be required to show proof that they are autistic or people of color. Because of that, applications will be accepted on an honor system, although we reserve the right to consider specific and concrete reasons to believe that a person is either white or non-autistic. If we have reason to believe you might not be eligible, we may deny an application or request more information, such as a reference. We ask for demographic information about yourself on your application, including your current income, whether you have received other sources of financial support or expect to do so, and how important a microgrant would be to achieving your goal. Review will take into account a person’s comparative need, access to resources, and other marginalized identities and experiences, in awarding microgrants. Once the fund receives your application, the reviewers will strive to make a decision within one month (target time two weeks), or sooner if the applicant indicates a time-sensitive or emergency need (target time three days). We can’t promise a specific time frame since we are all volunteers, but we will do our best to meet these guidelines. The fund will be administered (and applications reviewed) by Lydia X. Z. Brown, Morénike Giwa Onaiwu, and E. Ashkenazy, on behalf of the Autistic Women and Nonbinary Network’s Committee on Autism, Race, and Ethnicity. You may receive the exact funding amount requested. You may be granted a higher or lower funding amount than what you requested (but always under $500). You may be declined at this time (but you can still apply in the future if you are eligible). If we decline your application now, we might be able to fund it in the future. We will tell all applicants whether their requests have been approved or declined. Once approved, you will be able to receive money through electronic transfers, PayPal or other online payment systems, or a paper check — your choice. Grantees receiving funds through PayPal will receive funds within 72 hours of approval. Grantees receiving funds through check, electronic transfer, money order, or any method, will have funds sent within one week of approval. What can I use money for? Unfortunately, you can’t apply for funds to use in activities that directly support or directly oppose a candidate in a political campaign or election. Your application must explain the reason you are requesting funds, and the amount (between $100 and $500) you are requesting. We also ask you whether we can have your consent to share information about your grant publicly or privately if accepted, and if so, whether we have consent to share your name or initials, and any details about your need. Please only use the emergency application if you are in a crisis right now, and you’re asking for funds to help with the crisis. All others please use the general application. You will have an option to tell us how urgent/time-sensitive your request is. It should take about 45 minutes on average to complete the application using this web form. There are 24 total questions beginning on the next page. Not all of them are required. If you prefer to fill out a single document in Microsoft Word or PDF, email communityfund@autismandrace.com to request a downloadable version. If you prefer to fill out a paper application, please email communityfund@autismandrace.com with your complete mailing address. If you prefer to submit a video responding to the questions, please upload it to YouTube or another video-sharing site, and send the link (NO ATTACHED VIDEOS) to communityfund@autismandrace.com with your name in the email subject line. If you prefer to answer questions by phone, you can email communityfund@autismandrace.com to schedule a time. You can also have someone else email for you, but make sure they provide your name so we know which person is applying for funds. If you’re here because you’d like to donate to the fund, please make your donation to the Autism Women’s Network via www.autismwomensnetwork.org, and make sure to send a note that your donation is for the Autistic People of Color Fund. If you are a family member (such as a parent, sibling, spouse/partner, or other relative) or a support person wishing to complete an application on behalf of your child / relative / person you support, please only do so if that person is unable to complete an application on their own. We accept applications in multiple formats (see above), so a person does not need to be able to type or use the internet to send an application. 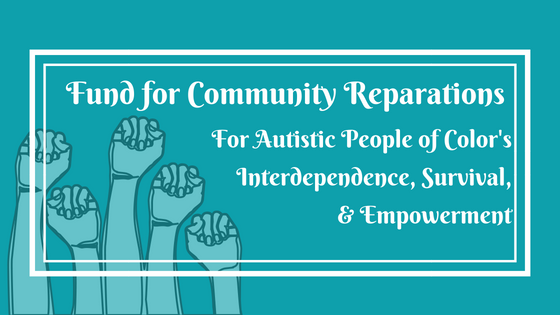 If the person is unable to complete any format of application, you are welcome to use our General Application to apply for funds, or to request an alternate format by emailing communityfund@autismandrace.com. Please make sure to provide your name and your relationship to the person who the funds would be provided for. I don’t need funds / I’m not eligible, but I would like to help with this effort! We accept donations to this fund — to have money sent to this fund, please donate to AWN and send a note indicating that the donation is for the Autistic People of Color Fund. You can send your note in an email to donations@awnnetwork.org to make sure that your donation goes to the right place. If you are part of a corporate donation-matching program, a grant-making foundation, or other group that is interested in making a larger gift to the fund, please reach out to us at communityfund@autismandrace.com to let us know how you would like to help.